What made you decide to compete? I like to explore different sports because it gives me direction and drives me to better myself. 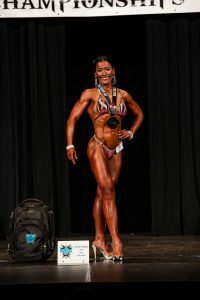 I never really thought I would try bodybuilding but me and my friend Donna made a pack that we would give it a try and so we did for the first time at this show. I also met a lot of women that worked out at our gym at Anytime Fitness and a group of women on Facebook that have tried it or been doing it or been wanting to do it which really inspired me more to just take the plunge! What obstacle did you overcome? Oh my there are so many I don’t even know where to begin. Just like any other sport you invest on gears that will help you perform better and it will cost. My first obstacle was having the funds without burdening my husband with all the expense. So I got a plain suit and stoned it myself. Got shoes from Walmart. I also thought I can get away without having a coach since I’m a Personal Trainer so I can cut cost. I was wrong that’s when reality really hit me hard and after 2 months of training on my own and eyeballing my macros and nutrition I told my husband I can’t do this on my own. I also couldn’t afford to get a coach. So he prayed for me that I find someone that will help me with my journey. It was a real Blessing that I came across Allie and Dee who just moved in Ames and was working out at our gym. I reached out to them and ask if they could help me. So my husband and I made a pack that we won’t eat out for the next 10 weeks and use that money to pay my coach. Well I guess when your prepping you cut cost also because meals are so on point. My whole family were very supportive of how my nutrition plays a vital role to be successful in this sport. We prepped together and that became our bonding. They respect that I can’t just eat whatever and whenever. What was the hardest part of the prep? Life doesn’t stop when your prepping, dishes pile up, holidays will show up, hormones will attack, work or school will still be stressful, family activities will not be postponed. The hardest part was finding balance during prep. Time management self control and DISCIPLINE was the main key for me to stay in the journey without sacrificing my job and love ones. So I had to build this mindset that it can’t be all about me. I had to find a support group that understood what prepping was all about and my coach will not give me a pity party when things get rough so I PRAYED a lot! God was my only true strength to get through all the prep that was required to get on stage. Having FAITH that if I had good intentions and trusted the process with His guidance I’m sure he will never fail me. So he lead me to reach out to people who have helped me through this journey since half the time I really have no idea if what I was doing was right or wrong. Just gotta have FAITH and give your BEST! What was the best thing about competing? The best thing about this sport is being able to step on stage and showcase everything you worked so hard for. The T-walk was my finish line. In my head after my T-walk “I did it! Thanks ya Jesus” I never really felt like I was competing with anyone but myself. I enjoyed the thought that I can be lean and walk on heels in a tiny suit at the age of forty. I realized that I can actually push pass my limits and go out of my comfort zone and be open to learning new things. It’s an achievement for me to be able to just step on stage everything else is just a bonus. What does it mean to you to be an IPE drug-free pro? What do you hope others can take away from your story?